Anxiety is a psychological state characterized by the exaggerated and persistent feelings of worry, tension, and nervousness, even when there's nothing to directly provoke these feelings. Anxiety disorders affect more than 40 million Americans on average, and occur twice as often in women as they do in men. There are several causes of anxiety, including stress and certain medications, like antidepressants. One of the leading causes of anxiety disorders in middle-aged women is hormone fluctuations. During menopause, estrogen levels fluctuate and drop to prepare for the end of the menstrual cycle. Estrogen considerably influences the brain's ability to regulate mood and emotions. Therefore, when a woman's estrogen levels decline, she is at higher risk of mental health disorders. Other factors that can induce anxiety include high stress (either at work or at home), genetics, excessive caffeine intake, emotional trauma, lack of exercise, and certain medications. 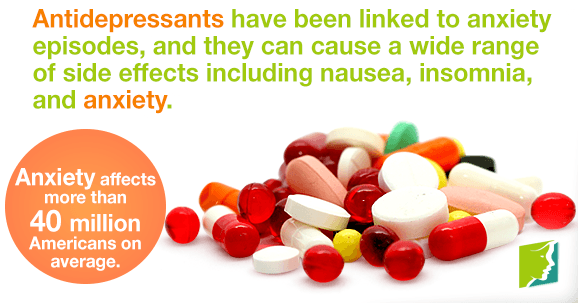 Antidepressants have been linked to anxiety episodes. The most widely prescribed antidepressants come from a type of medication known as selective serotonin reuptake inhibitors (SSRIs). SSRIs influence serotonin, which is a neurotransmitter in the brain that helps regulate mood. Serotonin also plays a role in digestion, pain, sleep, and other bodily functions. This is why SSRI antidepressants can cause a wide range of side effects, including nausea, insomnia, anxiety, headaches, and weight gain. It is important to be aware of the potential side effects of prescription drugs that you take and monitor those side effects that you experience. If you're experiencing recurrent anxiety episodes, you can talk to your doctor or psychiatrist about trying a different type of antidepressant or a lower dosage. In addition, several adjustments to your daily habits can keep anxiety at bay and even help manage the symptoms of depression. Making simple dietary changes can help you feel your best. Including protein, fiber, fatty acids, and fruits and vegetables into meals is ideal for optimum performance and boosting energy.Salmon, kale, guava, almonds, and low-fat yogurt are all healthy foods that have been known to help lessen anxiety. Drinking excessive amounts of caffeine can cause jitteriness, shakes, nervousness, and eventually, fatigue. Try to avoid caffeine, or at least gradually cut down to one cup of coffee or tea per day. Taking time every day for yourself is crucial for feeling good and treating anxiety. Taking a bath after a long day, reading, or meditating are all effective ways to relax the body and mind. The key to reducing stress and releasing serotonin in the brain is to exercise regularly. This means at least 30 minutes of aerobic activity daily, five days of the week. Walking, cycling, and swimming are all good forms of low-impact workouts that can help ease anxiety. Hormonal fluctuations are the primary cause of anxiety in menopausal women, but antidepressants have also been linked to cause anxiety episodes. Many of the common antidepressants are made from selective serotonin reuptake inhibitors, which influence serotonin in the brain. This can also affect sleep and other bodily functions. Exercising and taking time to relax and reduce stress are other helpful ways to ease anxiety symptoms.